Tal Ronnen‘s cashew cream is one of my favorite vegan ingredients. Similar to heavy cream, cashew cream is rich, fatty and full of flavor. I love using it in soups because it blends so nicely and the flavor works well with any kind of broth. I’ve combined the cream here in a hearty vegan chowder, packed with tons of dried oyster mushrooms and fresh king oyster stems. To infuse a rich smokiness into the broth, I melted down some raw virgin coconut oil and added a bit of liquid smoke and soy sauce. I really enjoyed making this on a late Sunday afternoon, developing the flavors and just enjoying the process before having this as a fabulous dinner that night. Make the cashew cream by placing the cashews in a blender. Add enough water so it slightly just covers the cashews. Blend for 3-4 minutes. Set aside. Boil the diced potatoes in plenty of water until softened, but still al dente, about 8-10 minutes. Drain and set aside. Heat 2 cups of the stock in a small saucepan. Turn off the heat and add the mushrooms. Place a lid on top and let sit for 15 minutes. Drain and set aside with the potatoes. In a large stockpot, melt the coconut oil over medium heat. Add the liquid smoke, soy sauce and onion. Saute for about 7 minutes. Add in the garlic and saute for 2 minutes more. Add in the thyme, pepper and salt. Add in the flour, stirring briskly to avoid scorching. Add in the mirin to deglaze the pot. Add in the 7 cups of remaining stock and bay leaf. Bring the stock to a boil and then immediately turn down the heat and simmer for 20 minutes. Test the stock and add more salt and pepper if desired. Add to the pot the cashew cream, potatoes, mushroom pieces and cashew cream. Simmer for just a few minutes more. 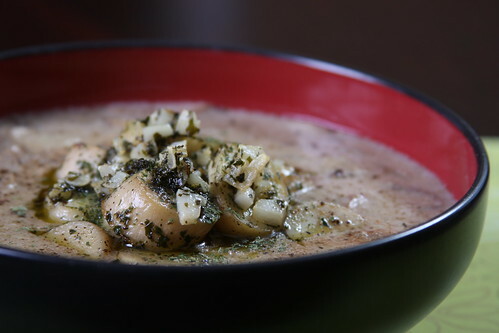 If you’d like to top the soup with some mushroom scallops, toss them in some melted earth balance and dried parsley and saute for a few minutes, until they are slightly toasted around the edges. I love adding cashew cream to soup! You have me intrigued with a vegan clam chowder, very awesome! I'm making this right now! I've also prepped your crab cakes (I'm going to bake them just to make them a little lighter, since we're having chowder and other things besides). I'll report back how it came out! P.S. I may add a teeny bit of kelp granules to the chowder . . . I love the seafood-y taste that it lends to stuff! Have you ever had a vegan tuna salad sandwich (chickpeas + kelp flakes; some people use jackfruit instead of chickpeas, which I REALLY want to try!)? Anyways, I love your blog. Seriously – sooooo inspiring!! I am so excited you tried this and the crabcakes out, Sunnie! I don't recall ever putting kelp granules on chickpeas for a tuna salad, but it sounds like a good idea. OH. MY. GOD. The clam chowder was AMAZING. I ended up adding about 3/4 TBSP kelp granules to it, just 'cause I love them. 🙂 My omni family LOVED it. Both of my parents are born-and-raised new Englanders (Mom's from Rhode Island and Dad's from Connecticut), so they've tasted good seafood. My mom especially loved the crabcakes! Perhaps the best compliment came from my dad, who said that your chowder was better than New England chowder, and that he'd take yours over the original any day! So happy you like, and thanks for sharing the dish with others — hope it is enjoyed!